You know how you sometimes overhear a conversation, or notice a social media thread, when someone says something so blatantly silly that you just shake your head. Well, over the weekend, I heard a guy mutter that he doesn't understand that when he is out sailing, and he has the right of way, shouldn't ships steer clear of him as he is under sail? Yes, I bet you've heard that as well, a least a hundred times. And my brother-in-law, a non-boater, was having dinner with a lady friend at Chesapeake City on the C&D Canal way north of here. He saw a big ship go past them on the relatively narrow canal. So he asked me what does one do when you come upon a large ship headed in the other direction? He said the ship seemed to fill the canal, perhaps an exageration given his lack of boating experience, but he saw the issue clearly enough. In case it isn't obvious, we all need to stay clear of commercial and military ships, and keep well out of their way. Seems pretty much just common sense, doesn't it? Well, apparently not everyone gets that simple message. I know there are lots of situations when you overtake another vessel, and in confined spaces it can be hard to manuever far enough around the other vessel to pass safely. In the Rock Pile, for example, a section of ICW in South Carolina officially known as Pine Island Cut near Myrtle Beach, where granite rock ledges extend far out from the sides of the channel. It is a pretty good idea to listen on your radio before you enter the area for the common practice of hearing a "Securite" call from ships and barge traffic coming from the other direction, as they have extremely limited maneuverability once committed to this 15-mile section of the waterway. You would be prudent to stop where you are and let the traffic come through before entering the Rock Pile. Even passing other pleasure boats can be tricky here, and I know of several boat owners who have very sad stories to tell about the Rock Pile. When it comes to all commercial ships it is better to simply stay out of their way. A huge car carrier chugging up the Bay is going a lot faster than you think. Do whatever you can to not put yourself and your crew in danger. The captains and pilots on these ships have very little control over their limited options. It is absurd to think a captain will veer off course because you cross his path. Even in an emergency a captain can't just put his engine in reverse and stop the ship in its tracks. It can take up to three miles from larger tankers to stop. It gets worse once the ship is committed to a shallow stretch of waterway affected by the bottom effect of pressure building between the ship's hull and the sea floor. There is little one can do to alter a ship's course in such situations. You also can't assume radar is bulletproof, or that simply having AIS aboard makes for a safe passage all the time. That tug could be towing more than one barge, and you won't likely even see the second barge on the radar. And if the tug captain is pushing or towing an empty barge, it might be harder to control if there is any wind. Conversely a loaded barge might raise or lower the water as you go by, pushing you into shallower water, or pulling you closer to the barge. If you find yourself anywhere near a tug and tow, always call the tug on VHF Channel 13 and ask what they prefer you to do. It is the practice of a competent boat operator. As I mentioned in previous posts, having two radios and the ability to monitor both Channels 16 and 13 is a very good investment for safe boating whenever there are commercial or military vessels in the area. And speaking of military vessels, if you approach a military warship, you should stay AT LEAST 100 yards away, and go by at slow speed. 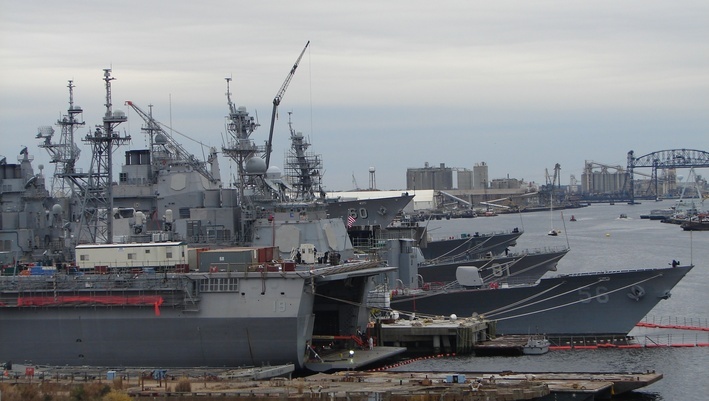 In tight quarters such as Norfolk, Virginia, the presence of Navy ships is so dense you'll find armed small boats constantly patrolling the areas around these ships. Flashing lights and loaded machine guns are not there for show. Given past attacks on Navy ships, it is taken very seriously. So if you are out sailing or plodding along at trawler speed and come across a ship of any size that can potentially cross your path, be a little more aware and proactive...and stay out of their way. Sail or power. Chesapeake Bay pilot Bill Band used to show his slides at the Safety at Sea Seminar at the Naval Academy. Seeing what his view is from the bridge of a large ship, with a small sailboat disappearing under the bow of the ship, clearly brings home the point. Don't be a knucklehead who relies on some test question about the Rules of the Road. Stay at least a ship's length from a ship's bow and 100 feet from the sides of the ship as it passes you by. 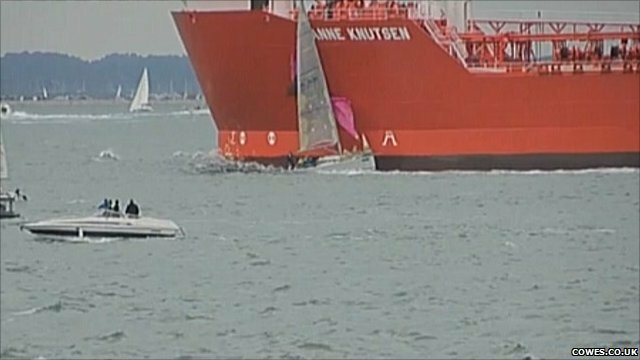 Under sail, the rules say you have privilege over powered vessels, but not over ships. Caught under the bow of a ship, you could wind up dead, and the ship's crew may not even notice the impact. Lots of thunderstorms this week, so I plan to tackle some projects on Blue Angel. Older PostAre You Well Equipped or A Hoarder?